The GetFurnished.com online store rents high quality lawnmowers, which will allow you to have a perfectly pruned garden. Whether you are a private individual or a professional gardener, the mower is an essential device when you want to maintain a garden. 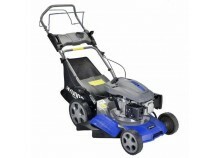 Thanks to GetFurnished.com, you can enjoy the rental of a lawn mower for periods ranging from 1 to 36 months. The contract is simple: you use your lawnmower for as long as you need it, and we come to pick it up once you no longer need it. Among the tools and machines we offer, lawnmowers are one of the most popular items. Renting a lawn mower allows those who occasionally need this tool to equip themselves for the desired duration, without having to carry it during periods when they have no use for it. This allows you to use your money wisely, you don't have to spend more than reason because you only pay for the use of the product. Small monthly lease payments are much more advantageous than a purchase, and allow you to realize the savings that make all the difference. Renting a lawn mower is profitable for both private individuals and professionals. Your garden needs a few mower passages and your machine is out of order? Maybe you just haven't bought any yet? No need to rush! Renting a thermal mower or an electric lawn mower is the perfect solution to avoid unexpected expenses. And if you are a professional gardener who wants to equip yourself for work, this option is also ideal to give you time to plan a purchase. Price: The main advantage of a lawn mower rental is the price. You can spend very small amounts of money to fully enjoy the machine as long as you need it. Quality: Our main objective is to ensure that our customers are completely satisfied. That is why we offer you high-performance machines manufactured by the best brands, as well as an impeccable delivery service. Simplicity: Choosing the right mower for you, getting it delivered to your home, and returning it only when you no longer need it: it's as simple as that. Choose the mower rental and enjoy a simple, useful and efficient service.